This page includes Shaughnessy Takes On... columns from the 2002 issues of Across the Fence Post. 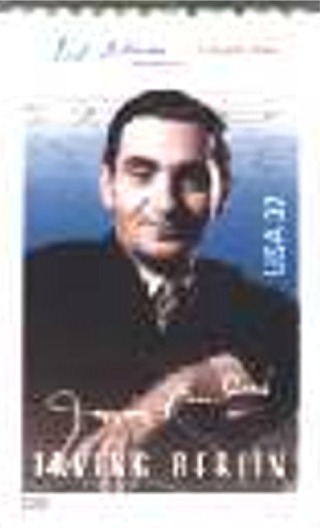 Irving Berlin, bless his all-American heart, deserves a Red, White and Blue stamp that shouts "God Bless America" instead of the drab drub as designed by the U.S. Postal Service. NOW is the time America needs this stamp! Yank this Doodle; it's NOT a Dandy! George Bush and Congress to the USPS: Drop dead! Which means that there will be no $6 billion check in your holiday postal box. USPS to postal users: Drop more money in our coffers next time you stop by to buy postage stamps. USPS to cachet makers: Drop us a preliminary design of your proposed cachet or else. Oh, the political correctness monster has raised his ugly head. If some bureaucrat doesn't like (or understand) a cachet design, sorry, we will not apply a First Day of Issue postmark and your covers are dead in the water. Who came up with this weird idea? What happened to freedoms of speech, ideas and the American way? It was bad when the USPS mutilated covers submitted for first-day cancellations; this idea is worse. Who let the dogs out? I'm referring to the 2002 postal issues. Well, there is a cute little puppy dog teamed up with a kitty extolling the virtues of spay/neutering, but someone should have neutered the Andy Warhol effort. Shucks, he's worth only 15 minutes of fame. Someone in the Olympic hierarchy put the arm on the USPS to issue stamps for the Utah Winter Games, but I guess the USPS was not happy to do so. First, they flat out told the Olympic Committee that no money would change hands, and then their block of four stamps rated a two by the judges. Ugly - I'm holding up a zero card. Someone really likes J.J. Audubon as we are getting another stamp for the birds. If these were his Elephant Portfolio the face value of 34-cent wouldn't fetch a perforation hole. But look, back in 1963 the first Audubon had a nickel face value. Alan Greenspan take note. Then we have the 50-stamp Greetings from America, the dwarf chamber-of-commerce-type postcard designs, which no one will buy to use. Once the state you mail from is used, hey, I have 49 stamps left over. The Houdini stamp looks nothing at all like Tony Curtis. We've had bugs, carnivorous plants and now we're going bats. Actually, bats are one of nature's best and I applaud their addition to our albums. It's just that they are not cute little fuzzy creatures with the myth about getting tangled in one's hair. This myth by a mile. "When I remember bygone days I think how evening follows morn, So many I loved were not yet dead So many I love were not yet born." This is the Winter of our Discontent as opposed to those contented cows who gave/give milk for Carnation canned milk. While the milk was irradiated, there is a big flap brewing about irradiated mail, a process our U .S Postal Service hopes to put into place in the near future. Mail is to be zapped to eradicate any traces of anthrax spores that may be present. If all mail is irradiated, stamp dealers, collectors, as well as many other vendors who send their products through the mail stream will no longer be able to do so with the assurance that when it arrives at its destination it will be in the same pristine condition as when it left. The machinery for nuking mail has been) ordered - in use now in the Washington, D C area - however, the word is that very short folks need not worry. "Gnome patrons" to their local post offices will get a pass. Oh, it's KNOWN patrons. If you just drop mail into a postal box it will be zapped. Stamp collectors will soon be on first-name basis with the staffs of their local post offices. "Hi there, it's me again mailing stamps." On June 30, the price for semipostals will go to 45-cent from the present 40-cent. 1 wonder when further price increases will turn them into full postals? The USPS announced that advertising mail volume "slumped" with 2.2 BILLION less pieces mailed last year. Funny, I noticed no drop in the ad mail 1 received. Total mail volume for first quarter of the current fiscal year was 2.8 billion pieces below the same period of the previous year, creating a host of new words they need to learn: "decline," "slump," "dropped," "bleak," -fell," and "borrow" - this last word from the U.S.Treasury, where the USPS is bumping up against its $15 billion debt ceiling. Wouldn't it be nice to be able to borrow money for your stamp collection? If you turned 34 years old on February 8, the USPS issued its Happy Birthday stamp for you, complete with your new age. As for this writer, even if the first-class rate were doubled, it still wouldn't reach my present age. You 34 young'uns are fortunate. Oh the shame of it all. We stamp collectors suffer from PPPR, that's Pretty Poor Public Relations. Take this from a column by Bob Greene in the Chicago Tribune in late February. He discusses the phenomena of self-adhesive stamps, where we have gone from "lick & stick" to "no spit" beginning in 1995 when just under 20 percent of stamps were SA to over 90 percent in year 2000! Bob was curious as to how this C-change happened almost overnight without much notice on the public's part. Bob was interviewing Don Smeraldi, a postal official, who remarked, "This is because the only people who really talk much about stamps are stamp collectors and they are also about the only people left who prefer the stamps you lick. This is because..." Bob followed with, "Oh, you (the reader) really don't want to hear. Smeraldi told me the reasons, but they are pretty dreary. May we move on?" Pretty dreary, eh? Better than ugly dreary? Speaking of no respect, how would you feel if you were the upcoming U.S. Postal Service's Greetings From America sheet that has one each of the 50 states' tourism enchantments? Stamps" were listed. Whoa, I counted only 49; Illinois was NOT among those listed. Oops. Fast forward to the Spring 2002 edition of USA Philatelic, Vol.7, No. l, in which the USPS describes and displays stamps and stamp-related products. This sheet is illustrated, the Illinois stamp is there, however NO New Jersey stamp is shown! Instead TWO New York stamps are there! Double oops. So the USPS prints up and mails out a colorful brochure to those on their mailing lists pointing out that "something important was missing from your Spring issue of USA Philatelic." Sorry folks, no error sheets as of this writing. While the headaches prevail at USPS, the president of the American Postal Workers Union, William Burrus, is quoted as saying the irradiation of mail to prevent anthrax contamination is an overreaction and that at least 87 workers at the Gaithersburg, MD, postal facility have reported health problems they say are related to handling irradiated mail. Or, as the headline of this story appears in the March 4, 2002, issue of Linn's " ... irradiated mail sickens workers." It also sickens collectors as cooking the mail cooks whatever is enclosed, including stamps for collectors. However, the Postal Service says its customers "can avoid the irradiation process by affixing postage meter strips or permit (imprints) instead of postage stamps to Ex-press or Priority mail." Oh sure, like we really want these. My take on the current philatelic scene: If Edna Ferber knew that she would be the subject of a stamp, I'm sure she would NOT have posed for THAT image used on the new 83c definitive. Come to think of it, my mom had one of those hats. Kermit the Frog sang about its not easy being green; however, it is easy having greed, not only in the corporate sector but also in stamp dealing. Dana Okey is not OK, pleading guilty to a felony count of violating the Sherman Antitrust Act. Okey joins Mark Morrow of Mark Morrow Stamps; Davitt Felder Jr., of his Felder Inc. firm; John D. Apfelbaum along with his firm; and two Brit dealers, "Tony" Feldman and Stephen J. Osborne, who were indicted in the same plot. What's going on here? Effective punishment might be soaking self-adhesive stamps from their backing eight hours a day, six days a week for 20 years. Let's see, we have the Bogart stamps; do you believe he rubbed out the face of Houdini as part of a contract put out on Harry? Weapon of choice was a Pink Pearl eraser, found in most schoolchildren's pencil boxes. If you don't like the subject matter of recent U.S. Postal Service stamps, just obliterate the printed version and draw in your own. Frida Kahlo comes quickly to mind. Where has Love gone? To pieces judging from the images of the new Love stamps. Would you even tile your garage floor with this design? Why am I not surprised that none of the USPS folks who develop, produce and manage the U.S. stamp program are serious collectors? This bit of information was revealed in a byline article in Linn's Stamp News. After reading the article, my impression is that these people have little idea of what they are doing. Most questions were shunted aside as unanswerable, although it was conceded that no matter what they might do, not everyone would be pleased. You have that right! What they should know is that the Bureau of Engraving and Printing produces far too many stamps as recently indicated by the Inspector General. This is news? The IG figures that in FY 2002, the excess printing will be 3.5 billion stamps. Quantities furnished by contract printers (such as Aston Potter. etc-) were not included. Is there anywhere near enough users/ collectors to sop up all this? So we don't have enough postage stamps; now stamps can be generated on personal computers. Oh boy, I'll bet collectors can hardly hold their water waiting for these. Drab, dull, unimaginative, those are the good points. One might as well collect bar codes instead. Is our president selecting the U.S. Postal Service 2003 issues? The preliminary design images were unveiled on August 15, at which time a USPS official stated there may be more ...and it may be that sonic will not be issued in 2003 after all. Most likely they'll all be self-adhesives, most will be rectangular size; however, a few might be larger. All are planned as 37^ stamps in flat panes of 20, unless stated otherwise. Likely three of these will feature a hidden image in the design. Oh, definitely. OK, I ask you, are we going to take on Saddam? Some 60 commemoratives are looking to greet postal patrons in 2003. From what 1 have seen, it is a nice mix. As 2003 is the 50th anniversary of the Korean War (has "MASH" been in reruns that long? ), the stamp commemorating that event is striking in design. These veterans will be proud. Oh great. Year 2003 is the Year of the Ram. Just what we need, more Dodge Ram truck reminders. Hit it! 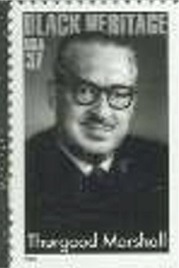 The late Thurgood Marshall is a wise choice for the continuing Black Heritage series, even though the family portrait wasn't selected as the design. It was a split decision five to four. Two hundred years ago we bought the Louisiana Territory from France on the stipulation that the NFL put seven teams into it. The luxury boxes took almost all that time to be completed. Jefferson would have liked that and we get another stamp to honor this event. However, none of the Early Football Heroes ever played in this territory. No domed stadium, no luxury boxes, no Super Bowl, heck, they had to play on both sides of the ball for the most part. That's why Bronko Nagurski, Ernie Nevers, Walter Camp and Red Grange deserve to be philatelically honored. So many deja vu stamps next year: Boris Karloff appears again (in the Makeup stamp), Ohio statehood, artist Mary Cassett, and the Wright brothers' first powered flight; along with the aforementioned Louisiana Purchase, it's not that they aren't good selections. Best selection is that of the Purple Heart 'Nuf said.